Using existing infrastructure assets as long as possible provides clear benefits. As most of the cost of providing the infrastructure consists of fixed past investments, and given relatively low current operating costs, each additional year of service will produce high value as the asset is amortized. The problems also are clear: the condition of the infrastructure keeps deteriorating as a result of ageing, usage and various external factors. Eventually, the asset may lose its ability to function cost-effectively or even to function at all. Invest in preventive and predictive maintenance, thereby keeping the asset in operational shape and preventing breakdowns. Avoid and control excessive asset consumption and stress, and thereby slow down the deterioration process. Enhance the asset’s resilience against disaster; in that way, extreme events should not produce a devastating effect. Preventive maintenance is applied to infrastructure assets suffering light to moderate distress. It involves planned treatments that are carefully timed and cost-effective. Its aim is to forestall costly corrective action and to improve the condition of a system before a failure occurs. Preventive maintenance enhances performance; it improves the quality, functioning and availability of a system for users. By preventing breakdowns, it saves the costs and inconvenience that users suffer as a result of blackouts or detours. A preventive maintenance strategy is clearly indicated, but it is not so easy to formulate, implement and adhere to. 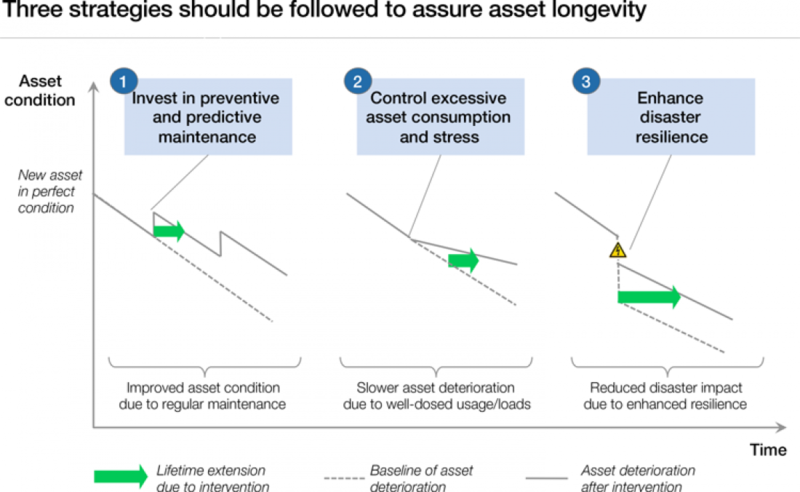 A structured approach is needed – evaluating the likelihood and impact of asset failures, customizing a maintenance strategy, assessing the asset’s current condition and creating a formal intervention plan. Monitor assets to determine their vulnerability and criticality. Record all past failures and the corresponding maintenance work for all structures, equipment and components. On a malfunction-cause-and-treatment sheet, note the downtime and the type of maintenance work undertaken. Record the types of failures, including the manner of failure, the circumstances and the failure-event sequence. Establish and analyse the root cause of the failure, and identify the components whose deterioration led to the failure. Assess the failure rate (taking into account the condition of the asset). If empirical data is limited, establish a risk measure through expert judgements and laboratory tests. To establish the criticality of each asset, estimate the impact of such failures in terms of lost revenues, increased costs and dissatisfied users. In addition, assess the level of service expectations and requirements of the users and regulators. Prioritize the assets in a risk classification matrix along two dimensions: failure frequency and failure impact (or vulnerability and criticality). Customize the maintenance strategy for each asset. Corrective/reactive or failure-based maintenance is a strategy that activates repair work in the event of a breakdown, and is designed to bring a failed system back to its operational condition. It should be the strategy of choice only if the risk of failure is very low and if the consequences of failure are fairly mild; or, where preventive maintenance measures are not available. Scheduled maintenance is performed at defined intervals, either after a certain period of use (time-based) or after a certain amount of usage (use-based). This is the strategy of choice when failures are costly or safety is critical, and when the failure rate is fairly low but tends to increase over time. The specific time intervals for inspections and maintenance can be based either on the manufacturers’ recommendations or on the operator’s experience. Condition-based or predictive maintenance is a strategy that triggers maintenance activity when the asset’s condition (as measured by machine diagnostic techniques or by continuous or occasional monitoring) falls below a certain threshold. The aim is to time the maintenance work optimally, so that it is not performed more often – and hence more expensively – than necessary, and so that it can be undertaken at a convenient time, when the service will be least disrupted. 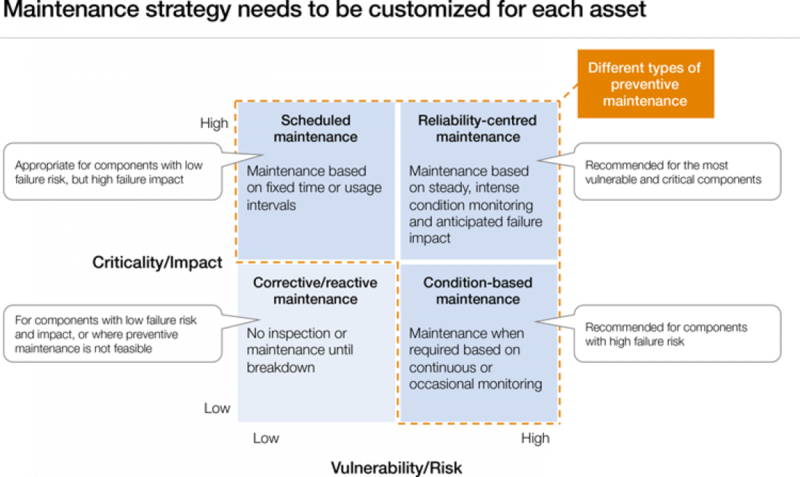 Risk-based or reliability-centred maintenance considers not only the asset’s current condition, but also the likely consequences of failure, including the impact on network performance. The main aim of this strategy is to reduce the overall risk and impact of unexpected failures, i.e. to ensure high reliability. The strategy involves inspecting and monitoring the high-risk components of a system very frequently and thoroughly, while paying less attention to evaluating the low-risk components. The trend is increasingly away from fixed-interval scheduled maintenance and towards predictive, data-enabled maintenance; the effect is to reduce waste, as equipment and parts are now exchanged only when they clearly need to be. The Massachusetts Water Resources Authority (US), for example, developed a predictive maintenance strategy based on condition monitoring and the probability and consequences of failure of each component. The programme increased equipment availability to 99%, and achieved cost savings by eliminating unneeded and low-value preventive maintenance work and shifting the freed-up resources to predictive tasks and actual maintenance work.125 To enable such predictive maintenance strategies, repeated assessments of the asset condition are paramount. Assess the asset’s current condition. Model the asset’s degradation process. For example, many UK water utilities use advanced decision support systems for asset deterioration curve modelling, based on statistical methods such as regression and Markov models. Develop a standardized metric for each asset’s condition, including a warning level that is typically set close to the fatal limit minus a buffer, which correlates with the processing time needed for implementing repairs. Network Rail in the UK uses a health index for its asset condition assessments. Draw up a tailored maintenance intervention plan for each asset. Select a specific strategy for each piece of equipment (sometimes even for each component), as each of them has its own distinctive failure rate, maintenance cost, serviceability and criticality. Infrastructure assets typically consist of different structures and pieces of equipment, so a one-size-fits-all approach is hardly appropriate. Contextualize the chosen treatment to the specific circumstances. For roads, the choice and timing of preventive maintenance treatments depend on such factors as climate, type of traffic and volume of traffic. In addition, consider the asset’s historical design and construction features, as well as the previous maintenance routines. Ideally, all data is recorded in an integrated asset management system (chapter 2.2). Determine an optimal monitoring and maintenance cycle. All too often, preventive maintenance cycles/intervals are based on conservative risk and warranty practices. Conduct a thorough review of risk and warranty, based on the asset’s vulnerability, criticality and components. Academic research can provide much guidance in this regard. Adopt a system perspective, not just an asset perspective. Take into account the components’ interdependencies within the complex system, and design an appropriate group maintenance strategy that maximizes overall reliability and availability, and takes advantage of cost synergies. Even the most conscientious preventive maintenance is no guarantee against failure, so all maintenance policies should include procedures for ad-hoc corrective/reactive maintenance. While prioritizing preventive maintenance, take care not to overmaintain. The best strategy is not the one that maximizes the asset’s lifespan, but the one that enables an optimally economical life and optimal availability. Preventive maintenance can be uneconomical if conducted to excess. 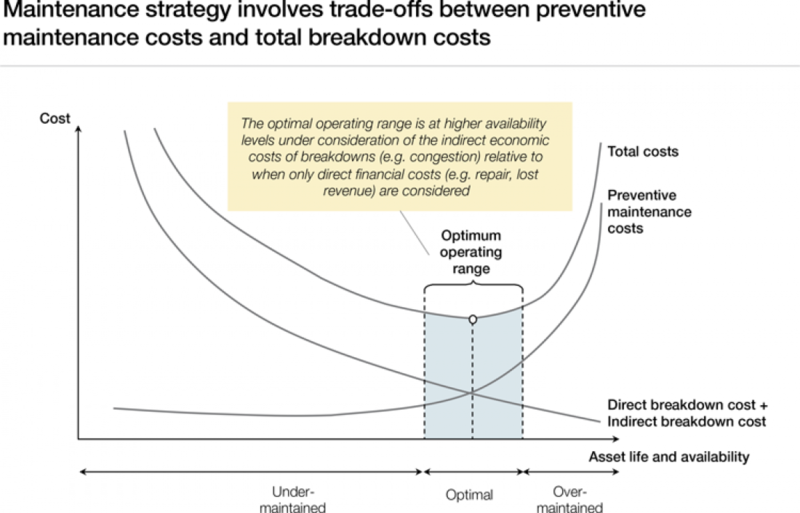 The optimal level will balance the preventive maintenance costs against the costs of breakdown and repair (Figure 23). Infrastructure assets suffer when subjected to inappropriate usage volumes and/or excessive loads. The resulting wear and tear from such uncontrolled practices can drastically degrade the asset’s condition and shorten its lifespan. Typically, an infrastructure asset is designed to accommodate a level of service within a defined range. For example, a road is constructed to a given degree of robustness, based on the anticipated number of vehicles and weight of the loads per vehicle. Usage requirements change, of course, so the original design parameters are sometimes exceeded. In the US, the majority of local roads were designed for far lower volumes of traffic than they now accommodate; since 1990, heavy-truck traffic has increased at a rate 50% greater than that of car traffic. Study and assess the empirical relationship between asset use and degradation. Consider, for example, the current proposal in Germany to introduce megatrucks (“gigaliners”) of up to 60 tons. Prior to authorization, the proposal is being studied in trials on specified roads in several federal states; this is to assess the impact that the vehicles will make on the service life and safety of roads and bridges. Enact rules and regulations, and develop operations manuals and restrictions that conform with the evidence. Leverage technology for usage monitoring. Embed incentives in user agreements or user charges. Infrastructure assets repeatedly face natural hazards, and can suffer major devastation – as shown by the broken telephone and electricity lines after Hurricane Sandy (Caribbean, US), the interrupted water supply after the earthquake in Chile, and the breached levees after Hurricane Katrina in Louisiana (US). The economic losses caused by such disasters over the past 30 years are estimated at US$ 3.5 trillion worldwide. Major disasters can cost about 5% of GDP, such as the 2011 tsunami in Japan, and more than 100% of GDP in low-income and small-island states.132 While these catastrophes dominate the media, equal or even greater losses can be caused by less dramatic but recurrent misfortunes. Although disasters are infrequent, infrastructure assets, with lifetimes of several decades, remain at risk. Moreover, natural hazards are becoming more common and more destructive; evidence suggests that their frequency and severity, and hence their damaging impact, are increasing.133 In the future, climate change could intensify storms, droughts, flooding, landslides, extreme temperatures and forest fires, particularly in coastal and arid areas, with dire effects on any infrastructure assets that were not built to withstand such forces. The Organisation for Economic Co-operation and Development (OECD) predicts a rise in sea level of half a metre by 2070; that would put 150 million people and US$ 35 trillion of assets at risk from coastal flooding.134 In addition to these hydrometeorological or geophysical threats, infrastructure assets are also increasingly under threat from terrorist attacks and even cyberattacks. Resilience measures tend to be neglected, however. The perception is that resilience-building generates low net returns on investment, in view of the long-term nature of resilience investments and the low likelihood of occurrence. A new approach and a new mindset will be required to remedy those shortcomings. Governments need to mainstream disaster risk management into all stages of the infrastructure life cycle – from planning and construction to O&M – particularly for critical infrastructure assets. To strengthen the infrastructure system’s ability to resist, cope with and recover from extreme events, a comprehensive set of resilience strategies is required (as follows, and Figure 24). Develop a master plan for resilience. Only a broad and holistic set of measures will ensure resilience. They need to be coordinated and integrated in a master plan. Conduct a scenario analysis (given the high unpredictability of extreme events) and a thorough socio-economic cost-benefit analysis to identify the optimal resilience measures. Prioritize the most effective interventions and filter out those least beneficial. In some cases, it might be so expensive to adapt to the new challenges that policy-makers might opt instead to relocate an entire infrastructure asset. Consider both “preparedness” and “responsiveness” measures in the master plan. Take a cross-sector perspective. For example, when evaluating energy production and water supply facilities, consider their linkage to agriculture, coastlines and the local ecosystem. Involve all the various operators and departments in a collaborative approach. Enhance the identification, assessment and communication of risks. Make a comprehensive assessment of vulnerability and disaster impact to quantify the risks and anticipate the potential damage, by geography and hazard type. Use such information for producing hazard maps and zones to enable governments and communities to make better-informed prevention decisions and to set priorities for developing, maintaining and adapting at-risk facilities. Combine structural with non-structural measures to reduce risk. Retrofit existing infrastructure facilities. Ensure compliance with updated construction codes and technical specifications, or relocate critical components. In Switzerland, for instance, the Les Toules dam was strengthened and modified in shape to enhance its resilience to seismic activity. Apply non-structural measures. Adapt policies and regulations on zoning and land use, for example by introducing risk-based territorial planning. Consider creating natural buffers; in Vietnam, eight provinces organized the planting of mangroves to prevent flooding of coastal roads or railway tracks. Relative to dyke maintenance, this natural, non-structural approach yielded an exceptionally high benefit-to-cost ratio of 55.140 A related approach suitable for urban environments is to create green areas that serve as “sponges”; many cities have encouraged the creation of parks and lake systems to retain and absorb overflows. Make appropriate preparations for managing residual risk. Even the most thorough preventive measures will sometimes prove insufficient, and reactive measures will be indicated. Clear plans should be in place for implementing them if the need ever arises. Develop improved models for predicting natural disasters, whether earthquakes or storms. Install early warning systems and enhance monitoring. Enhance disaster preparedness and refine emergency response plans; identify and improve evacuation routes, and conduct emergency drills. In the Netherlands, community water boards use volunteer dyke-watchers to check on the dykes, and train the watchers to contain breaches. (Re-)construct and rehabilitate for resilience. Strive for greater robustness when reconstructing or refurbishing assets. For example, Rotterdam (Netherlands) has built an underground parking garage designed to hold 10,000 cubic metres of rainwater.144 Opportunities to leapfrog infrastructure resilience standards particularly exist in post-disaster and post-conflict countries where significant rebuilding is taking place. 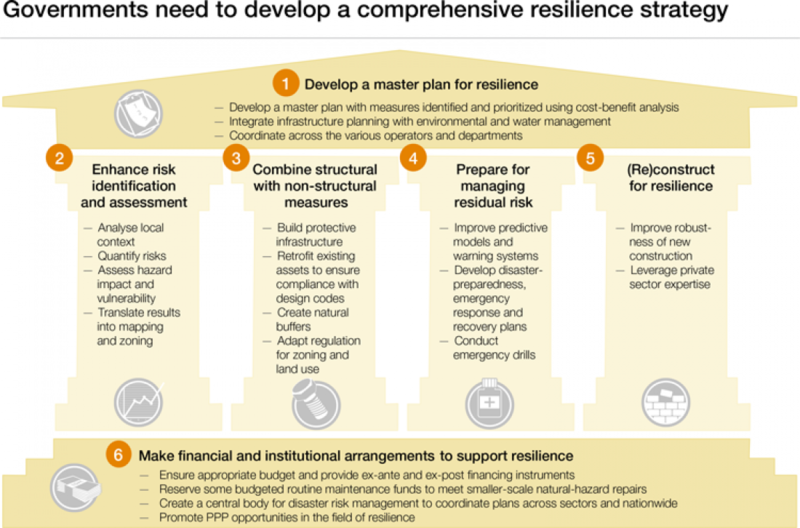 Make financial and institutional arrangements that can support resilience. Earmark some budgeted routine maintenance funds for smaller-scale repairs that might be needed in the wake of natural hazard events. Create a central body for disaster risk management that coordinates plans nationwide and across ministries and sectors (transportation, utilities and water/environmental management). The Republic of Kiribati, one of the nations most vulnerable to rises in sea level, has coordinated coastal protection by assigning the responsibility for the various initiatives, such as building sea walls, planting mangroves and improving water management, to a single high-level ministry. 120 Annual Local Authority Road Maintenance Survey (ALARM) 2011. March, 2011. London: Asphalt Industry Alliance (UK). 121 Levik, K. “How to sell the message ‘Road maintenance is necessary’ to decision makers”. Norwegian Public Roads Administration, http://ntl.bts.gov/lib/12000/12100/12140/pdf/Levik.pdf, 2007. 122 “An Overview of Preventive Maintenance Concepts and Practices (Education Program)”. Michigan Road Preservation Association, http://www.m-rpa.org/overview.htm, 1999. 123 Road Maintenance. Issue Brief. October, 2006. Sacramento Area Council of Governments. 124 Integration of Preventive Maintenance into the State Airport Pavement Management Process. October, 2004. Georgia Department of Transport/ Nebraska Department of Transport. 125 Case Study – Massachusetts Water Resources Authority. WERF Org. 126 Improving pipeline integrity with the Threatscan system – GE’s Industrial Internet monitors vitally important energy infrastructure. 2013. Oil&Gas Industrial Internet in Action, General Electric Company. 127 Hardy, I. “Bump and mend: The apps helping fix city streets”. In BBC News. 11 June 2012. 128 “Preventive maintenance on highway-railway combined bridges”. Joint Conference on Advances in Bridge Engineering-II, http://www.iabse-bd.org/old/45.pdf, 2010. 129 Biau, C. et al. “How to increase sound private investment in Africa’s road infrastructure: Building on country successes and OECD policy tools”. NEPAD-OECD Africa Investment Initiative. December 2008. 130 I. Vermeij et al. “Optimisation of Rolling Stock Wheelset Life through Better Understanding of Wheel Tyre Degradation”. Lloyd’s Register Rail Europe. 131 Merriss, J. New Research on Pavement Damage Factors. Oregon Department of Transportation. June, 2003. 132 Managing Disaster Risks for a resilient future: The Sendai Report. 2012. World Bank. 133 Natural catastrophes in economies at different stages of development. January, 2012. Munich: Munich Re/Geo Risks Research/ NatCatSERVICE. 134 “Rising Seas”. National Geographic, http://ngm.nationalgeographic.com/2013/09/rising-seas/folger-text, 2013. 135 Greene, R. A. “Corps of Engineers not liable for Katrina damage, court rules”. CNN, 2012. http://edition.cnn.com/2012/09/25/us/louisiana-katrina-lawsuit. 136 Marshall, B. “Funding crisis looms for $14 billion hurricane protection system”. The Lens, 2013. http://thelensnola.org/2013/02/14/a-cadillac-flood-defense-but-now-comes-the-hard-part-paying-for-it/. 137 A Stronger, More Resilient New York. New York: The City of New York, June, 2013. 138 Saghir, J. “Tackling the Climate Vulnerability of Africa’s Infrastructure”. ICA, 2013. www.icafrica.org/en/news-events/ica-news/article/tackling-the-climate-vulnerability-of-africas-infrastructure-4539/. 139 “Rising Seas”. National Geographic, http://ngm.nationalgeographic.com/2013/09/rising-seas/folger-text, 2013. 140 Investing in Resilience – Ensuring a disaster-resistant future. 2013. Asian Development Bank. 141 “Disaster Management”. World Economic Forum, http://www.weforum.org/issues/disaster-management. 142 Pique, J., Martel, P. How Peruvian Seismic Code Greatly Improved Building Response to Real Earthquakes. Vancouver, B.C., Canada: 13th World Conference on Earthquake Engineering, 2004. Paper No. 1825. 143 Boesch, D. F. et al. Updating Maryland’s Sea-level Rise Projections. Special Report of the Scientific and Technical Working Group to the Maryland Climate Change Commission. University of Maryland Center for Environmental Science, Cambridge, MD, 2013. 144 “Rising Seas”. National Geographic, http://ngm.nationalgeographic.com/2013/09/rising-seas/folger-text, 2013. 145 FONDEN: Mexico’s natural disaster fund – A review. 2012. Washington DC: International Bank for Reconstruction and Development/World Bank. 146 “Success of Kuala Lumpur’s dual purpose tunnel”. ITS International, http://www.itsinternational.com/categories/detection-monitoring-machine-vision/features/success-of-kuala-lumpurs-dual-purpose-tunnel/, 2012. 147 How to Make Cities More Resilient: A Handbook for Local Government Leaders. 2010. United Nations Office for Disaster Risk Reduction.